Download MP3 above or scoll down for YouTube and SoundCloud options. 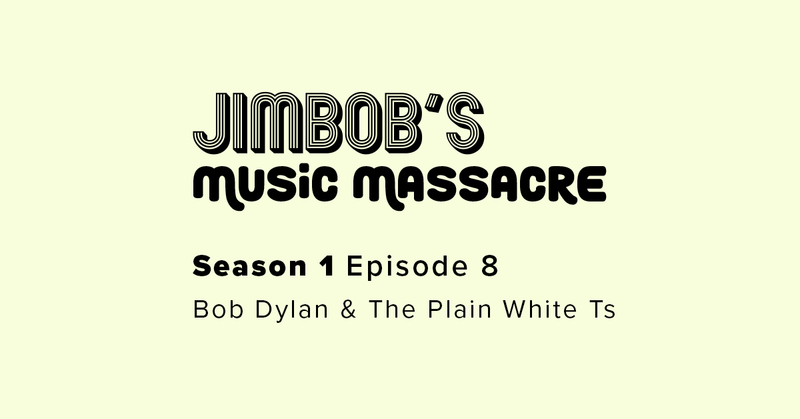 The final episode of Series 1 of JimBob’s Music Massacre is her and it’s ending where it began with show-favourite, featured-artist Callum McIntyre.This comedy music podcast stretches the lyrics of your favourite songs to breaking point as hosts Jim & Bob are joined by guest musicians to help highlight the issues. This week they finally dare to tease the great Bob Dylan and risk the well-documented ire that this can bring from Dylan fans and they also discuss some of the work of The Plain White Ts (which may or may not have similar repercussions). This is the final episode in a series that playfully teases your favourite artists about lyrics that don’t quite make sense!! We’ll be away for a few weeks and then will return with Series 2 later in the year…so in the meantime check this out now and then catch up on all the other shows!! Where did ‘his lovely’ go to?